Religious doubt is not something new. All the great spiritual leaders had their "Dark Night of the Soul" when they questioned their beliefs or were tempted to abandon God. Jesus had his moments in the dessert. The temptation of Christ, in Christianity, refers to the temptation of Jesus by the devil as detailed in these Gospels (the New Testament of the Bible): Matthew 4:1-11, Mark 1:12-13, and Luke 4:1-13. Christian translations often use the term Satan to describe Jesus' adversary in this narrative. According to these texts, after being baptized, Jesus fasted for forty days and nights in the desert. During this time, the devil appeared to Jesus, and tempted him to demonstrate his supernatural powers as proof of his divinity -- each temptation being refused by Jesus with a quote of scripture. The Gospels state that having failed, the devil departed, and angels came and brought nourishment to Jesus. In Buddhist tradition, a super natural being tempts the Buddha in various ways, including urging him to transform the Himalayas into gold. In a famous incident similar to the temptation of Jesus in the Christian religion, Mara urges Buddha to become a universal king, and establish a great empire in which men can live in peace. He reminds Buddha that he can turn the Himalayas into gold if he but wishes so that all men will become rich. Buddha replies that a single man's wants are so insatiable that even two such golden mountains would fail to satisfy him. "Great Doubt: great awakening. Little Doubt: little awakening. No Doubt: no awakening"
And, although we are no Jesus, or Buddha, our "temptations" and moments of failure and doubt are no less real or compelling. The journey is long, and there are many dead ends along the way. All we can do is turn around, and find our way back on the correct path. "Doubt is but another element of faith." PROFESSOR: "How can you say you are an atheist (meaning, there is absolutely no God) when you agree that you have less than one percent of total knowledge?" STUDENT: "I guess I need to say I am an agnostic -- I don't know if there is a God." PROFESSOR: "A hard agnostic says, 'You can't know if there is a God,' and a soft agnostic says, 'I don't think there is a God." PROFESSOR: "Can you be sure that ...you can be sure that there is not a God? Or, do you know for sure that ...you can't know anything for sure?" STUDENT: "That's right. I have never been exposed to any evidence about ...God, ,,,life, ...life after death, ...or the ultimate meaning of life." And, that is where we must start with the question: Is there sufficient evidence for me to conclude that there is a God, and that I can have a personal relationship with Him? 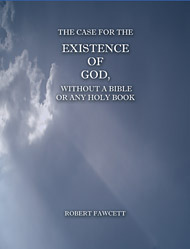 And that is the reason we created this SPECIAL REPORT, The Case For The Existence Of God, Without A Bible Or Any Holy Book.